SciFiGuy.ca: It's a bird, it's a plane - NO! It's Stephenie Meyer! It's a bird, it's a plane - NO! It's Stephenie Meyer! "Stephenie Meyer's vibrant storytelling has captured our hearts and the hearts of millions of readers and moviegoers, and we are excited to offer this Dazzled by Twilight Exclusive Edition of Female Force - Stephenie Meyer - direct from the heart of Twilight in Forks, Washington." said Annette Root, the store’s owner. 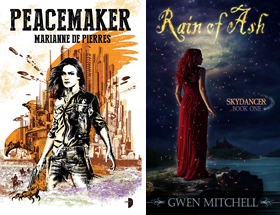 The comic, written by Ryan Burton ("Flying Saucers vs The Earth") examines Meyer’s rise to popularity, her "Twilight" saga novels, the launching of the successful movie franchise and her future plans. According to Burton, a very recognizable and iconic vampire will serve as the story’s narrator. 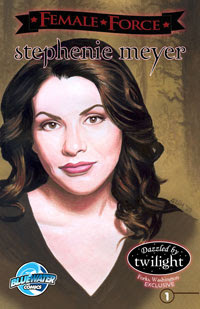 Female Force: Stephenie Meyer, scheduled for release the same day the movie hits theaters, November 20th. The Dazzled by Twilight edition can only be purchased at the retail location (61 N. Forks Ave, Forks, WA) or Dazzled By Twilight’s online store: www.dazzledbytwilight.com. She looks the tiniest bit like Rosie O'Donnell in that caricature. Falling Off the Shelf it did bring a smile to my face. I wonder if people actually buy these to read or if it is Twilight collectors only. Danielle I think Rosie would be be pleased to hear that. It looks kind of like the photo from when Stephenie appeared on the cover of Time magazine.